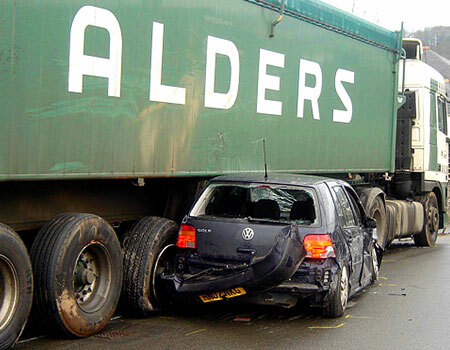 Satellite navigation sends drivers completely the wrong way every day (or so they say) - but trucker Patrick Van Houdt must be regretting the day he chose to rely on his own sense of direction rather than buy a sat-nav system. The father-of-four was on his way to an iron foundry when he became hopelessly lost. Unable to get his bearings, he stopped at a garage to ask for help. An attendant handed him a hand-drawn map ... alas, with the wrong directions. Minutes later, the baffled 45-yearold found himself and his 7.5-tonne lorry in a quiet cul-de-sac. It did not remain quiet for long, however. Unable to reverse, Van Houdt tried to negotiate a mini-roundabout but drove across it, ripping up two trees and demolishing a brick wall. He then smashed into a VW Golf - owned by England rugby star Olly Barkley - before panicking and hitting the accelerator instead of the brake. As he careered downhill with the Golf acting as a battering ram, he hit a Peugeot 306, Mazda RXF, Renault Laguna, Vauxhall estate and a Nissan Micra – all in all causing £20,000 of damage. When he eventually came to a standstill, he was confronted by a mob of angry residents in Wadebridge, Cornwall. Van Houdt, of Maaseik, Belgium, appeared before Bodmin magistrates last week and admitted dangerous driving. He was fined £1,500 and banned from driving in England for 12 months. Philip Somarakis, in mitigation, described the incident as a 'very bad day at the office'. It was Van Houdt's first blemish in a 17-year driving career and he had been ridiculed by his colleagues, the court was told.